I can't believe how quickly the twelve days has gone! Lots of amazing tags in the gallery - make sure to check them out. The linky will remain open for another week so keep those tags coming! Robyn's tag information and how to's are listed on her blog (link provided). Click HERE to be forwarded to Robyn's blog post. There you will find out how she made this gorgeous tag! Julia, Darnell, Linda, Nancy S., and Robyn. You have all outdone yourselves! The linky will remain open for another week, closing at end of day Nov.23rd, so there's still lots of time to play along. Come join in! The top tags will be announced on Nov. 30th. Robyn's tag is so pretty and textured too. Off to see her details. 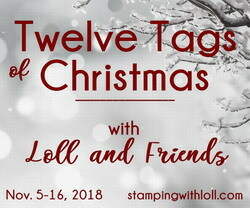 Gorgeous tag for the 12 Days finale! Love the holographic paper you used for the deer! Pretty background with the embossed design! Thanks so much for doing the event! Lots of beautiful tags to see in the blog posts and in the challenge entries! Oh wow, Loll, your tag is gorgeous and so is Robyn's. Simply stunning. Your tag is very elegant and pretty! The gold shiny deer is gorgeous! 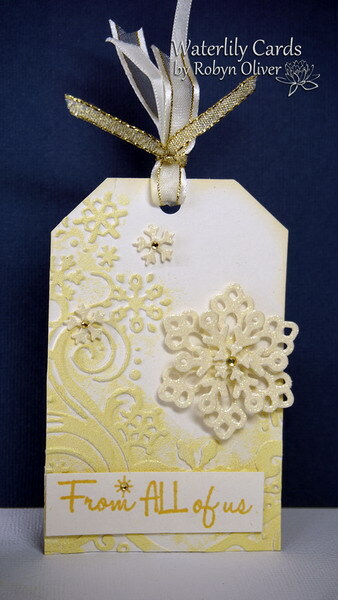 A very pretty tag from Robyn, too, with the embossed background and lovely snowflake! This is the most wonderful deer, Loll! I love the size, shape and holographic gold foil! A beautiful background and bow! I think you saved the best for last....or maybe not! Twelve gorgeous tags, my friend! You have inspired all of us! What a fabulous tag to end this fun event, Loll. The pastels are just gorgeous and love the stenciling over your mono-print. Your deer is just amazing with all the sparkle and shine. Love that you carried your color to the edges of the torn paper. Robyn's tag is beautiful with her soft yellow and wonderful top treatment. The holographic reindeer is so wonderful - and what a great choice of embossing folder to go behind him with the swirls reflecting the swirls of his antlers! Love how elegant both your tags are today! Love the gold! Oh my goodness! These two tags are gorgeous! What a way to cap off this fun event. Thank you so much for sharing your talents and highlighting your friends as well. You are amazing and so are the tags you've created. Again, wow! What a glorious mixed media tag with great techniques and beautiful colours. Stunning tag and sadly the last one. Your tag event has been a huge success .....again and the gallery is looking wonderful with so much creativity, inspiration and so much fun. Both tags beautifully done! I love the deer in your tag on the incredible background you created and I'm loving Robyn's non-traditional color choice for her tag! You girls outdid yourselves!! A fabulous end to a fabulous event. I love your final tag, what a way to finish. 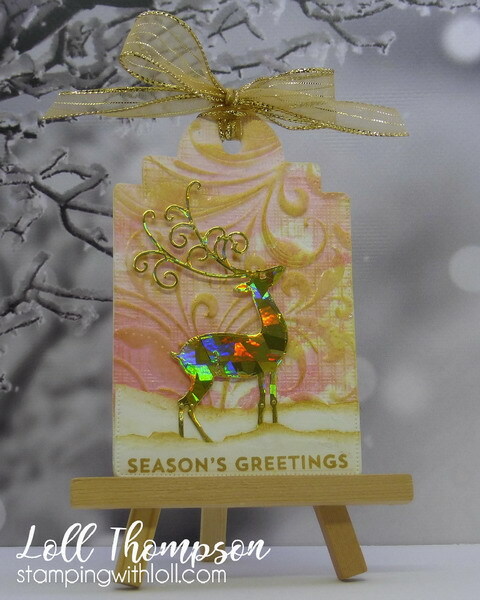 The embossed background looks fab and I love the holographic reindeer. Thank you so much for hosting this event for the last five years it's been amazing. This year's gallery looks stunning by the way! I'm so proud to have been one of your Friends/Guest Designers. Wow, you ended this wonderful event with an absolutely stunning tag, Loll! All the wonderful effects of the techniques and the gorgeous colors! The background is totally "YOU" and the holographic gold foil deer is just amazing! It looks like it's saying "I've done it!" with joy. Thanks so much for all your hard work and inspiration for the last five years. I started joining this event last year, but I really enjoyed the fabulous tags on your Pinterest boards of the past years too. Wow! Your deer looks stunning! I love how it shines with hologal film. Perfectly fits the beautiful pressed background. Oh my gosh, your deer is STUNNING, Loll! I'll bet it looks really amazing in person, too! Love how it pops against your background with all that lovely pink and gold texture! You and every one of your guests have had such a successful year with your 12 Tags of Christmas Series...I've enjoyed it so much...Thank you! I'm so sorry I wasn't able to participate in your grand finale of the 12 Days of Christmas tags, Loll. This deer is absolutely gorgeous and I was also awed by the shimmery silver ornament and the large poinsettia on the green background. Such talent on those smaller formats.